Why Replace a Non-volatile SRAM with MRAM? Every write with an MRAM is instantly non-volatile for at least 20 years. There is no transfer of data from a volatile to a non-volatile memory cell, no external capacitors or back up batteries. The elimination of external components, highly reliable data retention, and 35ns SRAM compatible READ/WRITE access times make the Everspin MRAM a viable candidate for increasing system memory density without major PCB changes while reducing system cost without compromising system performance. Non-volatile SRAM (nvSRAM) is an SRAM memory that is made up of two functional components paired in the same physical cell. One component is a standard SRAM memory cell and the other component is a non-volatile cell that acts as a backup to the SRAM cell. Data are transferred to and from the non-volatile cell by Store and Recall commands. Data are protected during power loss by using either an external capacitor or an external battery to power a Store command. Magnetoresistive RAM is inherently non-volatile, with unlimited endurance for stored data, even when power is lost. Immediate (<1ns) Power-off with no loss of data. Always non-volatile. No unreliable capacitor-dependent backup cycles. No VCAP or VBATT required. No complex software STORE/RECALL routines. 20-Year data retention with no cycling dependence. Fewer components mean a smaller design footprint and lower total BOM cost. In many cases directly replaces nvSRAM. 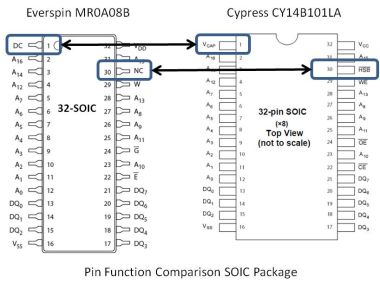 Everspin MRAM is available in x8, x16, Serial SPI, and Quad Serial SPI interface configurations. Click on the Product Family below for more detail.